Banteay Srei may be the most beautiful Khmer temple, but Ta Keo is one of the stateliest. They’re two of the Khmers’ most influential buildings, yet their personalities contrast. Ta Keo was begun and completed in two very different political climates, and this might have helped form its character. King Jayavarman V started to build it as the state temple. He succeeded his father, Rajendravarman II, the builder of Pre Rup, and the king who presided while the official who became Jayavarman’s guru erected Banteay Srei. 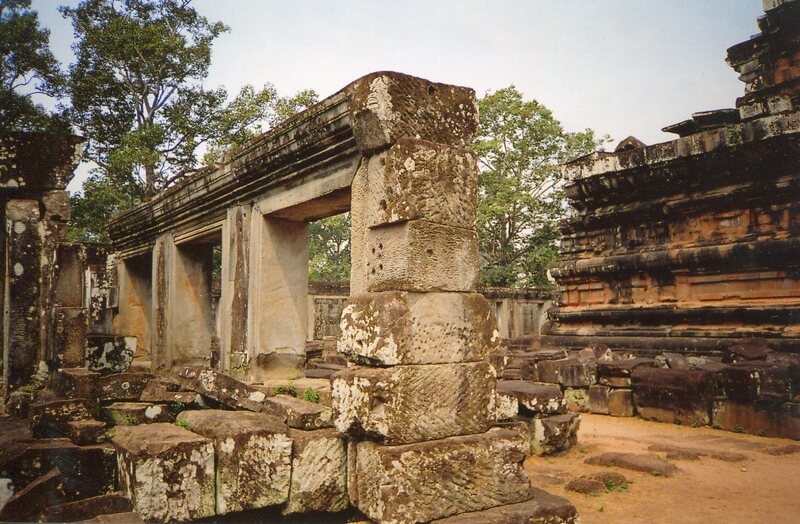 Jayavarman inherited a strong empire, which his father had extended. The son’s reign was long, and known for tolerance–Buddhist teachers flourished though the royal cult was mainly Hindu, and many women enjoyed prominent political roles. But Jayavarman’s rule ended in 1000 or 1001, and violent succession crises followed until Suryavarman I vanquished all his rivals around 1010. The last major construction of Ta Keo was done during that turbulent decade. Suryavarman would extend the Khmer Empire further, and build large symmetrical monuments, including Preah Vihear, in newly ordered lands away from Angkor’s political center. The formality and elegance of Ta Keo’s facade in the two pictures above suggest a reversion back to the mentality behind Pre Rup’s design. Both temples use symmetry to project royal power. But Ta Keo adds the opulence of Banteay Srei and Preah Ko. 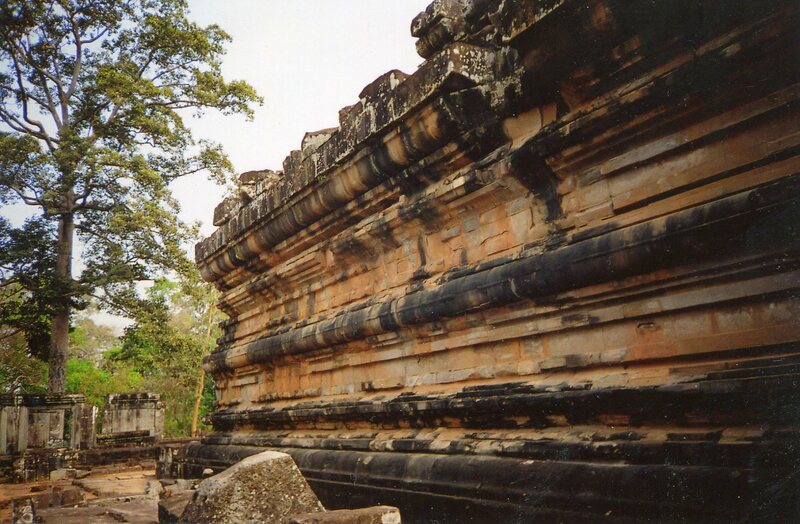 Like Pre Rup and the earlier state temples the Bakong and Phnom Bakheng, Ta Keo embodies the cosmic mountain from Indian mythology, Mount Mehru. All temples have a central tower and 4 surrounding spires, which represent Mehru’s 5 peaks. But the builders of Ta Keo initiated major directions that led towards Angkor Wat. 1. 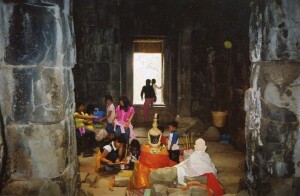 Ta Keo was the first major Khmer temple with a continuous stone gallery around the central section. 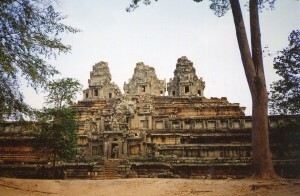 This configuration became more complex at Angkor Wat and later great temples like Preah Khan and Ta Prohm. You can see some of the gallery in the above photo. 2. It was the first major Cambodian temple built entirely from sandstone, rather than mixtures of brick and laterite and sandstone. 3. You can’t see the upper gallery or terraces from the ground. Angkor Wat has this trait too. Both can seem mysterious and daunting when you approach them. Helen Ibbitson Jessup wrote that Ta Keo seems even more stern because it’s two lower terraces are high and their stairs are very steep. This strictly vertical facade blocks the view of the upper terrace and towers all the more. Suryavarman didn’t add significantly to Ta Keo when he took the throne. LP Briggs thought his rule was the most successful in Khmer history. He extended the kingdom more than anyone else had done, and most of his time on the throne was peaceful. His rule began as Ta Keo was completed, and this temple reached back to the tradition from Bakong, Phnom Bakheng and Pre Rup by projecting a mixture of symmetry, power and aristocratic elegance. Suryavarman inherited a monument that served as a model of order, and which pointed towards the glories of more complex temples that his successors built. But this stately temple was taken over by local children when I was there. An old woman with them looked haunted, as though her memories of the Killing Fields were as fresh as today’s breakfast. I found it very hard to look into her eyes. But the children were playful and energetic. Let’s wish them a future as glorious as Suryavarman’s reign.